One of the more costly (and unhealthy) routines I once had was grabbing sodas out of the refrigerator, taking them into my office, and gulping them down. Not only was it costing my health, but it was also an expensive routine. Even if you buy in bulk, a can of soda is still going to cost you a good quarter. Obviously, this was a routine that needed to change, both for my body and for my wallet. My first approach was to start buying bottled water in bulk. Once the caffeine headaches passed, this routine worked pretty well. I’d buy the bottles in bulk, keep several of them in the fridge and just refill my supply when it got low. There were two problems with this approach. The first one was flavor. Drinking lots of bottled water and little else is simply bland. My taste buds yearned for something else. The second problem was cost. Buying bottled water instead of soda was healthier, but it didn’t really save me any money. Eventually, I solved both problems. 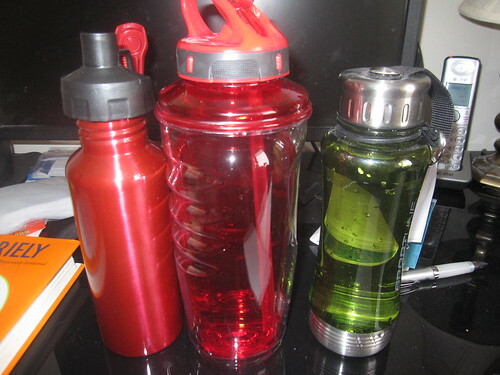 I started handling my own bottled water. How did I get the bottles? As you can see, they’re mismatched. I’ll pick one up whenever I find one on deep discount somewhere because they do sometimes wear out after years of use – the straw attachment will break or something. I usually try to never spend more than $1 on them and I’ll sometimes pick up branded ones for free. My filling procedure is pretty straightforward. I’ll fill several bottles, put them in the fridge, and just go through them as needed. When I see the number in the fridge getting low, I fill more bottles. It doesn’t take too long – maybe a minute to fill several bottles. Once they’re filled, it becomes very convenient to just grab a bottle from the fridge and gulp it. It’s easy to add some variety, too. I’ll add a couple teaspoons of lemon juice to a bottle. I might add a teaspoon of honey to a bottle – or both lemon and honey. My favorite tactic, though, is to toss a teabag or two into the bottle as soon as I fill it, then let that teabag stay in there until I’m ready to drink the bottle. If it’s got tea in it, I thoroughly shake the bottle before drinking it. I usually leave the teabag in until it’s easy to retrieve it and throw it away. There are a lot of benefits of doing this beyond just saving money. I very rarely have headaches. Before cutting out sodas and other beverages, I used to get a few headaches a week. Now I get one once a month at most, and those are usually due to other factors, like exercising without being adequately hydrated. I lose weight easier. It’s more than just replacing soda with water. Being hydrated improves your body’s function in a lot of ways. For me, one of them is that weight loss becomes much easier. It’s much easier to just bring my own water to the gym. That means I’m not dropping a dollar into the can to take one of their overpriced bottles. Having a bottle in the fridge at home means I just grab it and go out the door. This also makes sure that I stay hydrated there by keeping me from being cheap and not spending that dollar on bottled water. It helps with road trips, too. If I’m driving somewhere, I’ll just toss some bottled water in the car. This way, I’m not tempted to stop somewhere to purchase an overpriced beverage because I already have beverages in the car, ready to go. If you’re trying to break a soda addiction – or even if you’re trying to get out of a chain of buying bottled water – give this a try. It certainly worked for me.